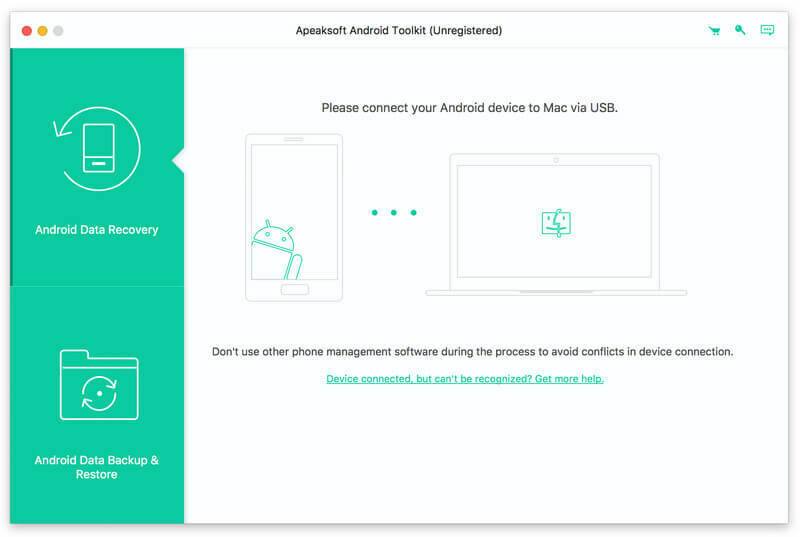 Apeaksoft Android Data Recovery for Mac can not only retrieve deleted text messages, photos, contacts, videos, audios and more files, but also can make a backup for the files on Android devices. Besides, this software can support any Android devices such as Samsung Galaxy Note 5/4, Samsung Galaxy S6, HTC M9/M8, LG, Sony, Google phone, ZET, Huawei and more Android phone. Besides, it is highly compatible with Android OS between 2.1 and 5.1.Key features:1. Recover deleted photos, contact, videos and more date from Android devicesThis Android Data Recovery Mac can help you recover deleted contacts, messages, call logs, text message, photos, videos, audios and more files for Android phones like Samsung, HTC M9/M8, LG, Sony, Google phone, ZET and so on.2. Recover Android data from internal SD CardAndroid File Recovery Mac can retrieve the data on the internal SD Card. For example, if you have backed up your text messages in your SD Card, but for some reason, you lost them. Then with this software, you can get them back and save on your computer.3. Fast recovering speed and easy useAndroid Recovery Software for Mac can help you recover your lost data in short times. You just need to connect your Android devices with the computer, and open your USB debugging mode, and then choose the files that you want to recover.4. Preview the data before recoveringWith this Android Data Recovery Software for Mac, you can preview all the deleted text messages, contacts, photos, call log and more. Then you can decide to recover which one files in the computer. The software can also help you distinguish the deleted data from the existing ones by different colors.